Principal post and only female candidates for Physical Director Posts. Interested candidates can send their resumes with attach all Educational certificates copies to college email address are maintained below. 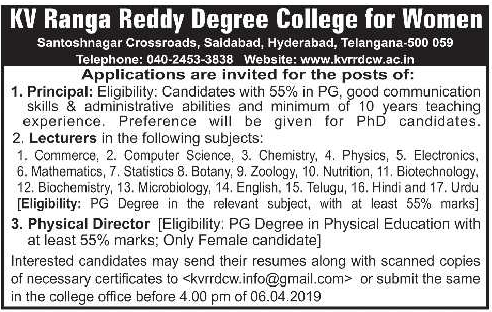 Further information can refer the official website www.kvrrdcw.ac.in for KV Ranga Reddy Degree College for Women Principal/Lecturer /Physical Director. More details Like Selection Process, Important Dates, Qualification, Salary and e.t.c. Are available given below. KV Ranga Reddy Degree College for Women. Starting date to apply for KVRDCW Principal/Lecturer Jobs: 03-04-2019. 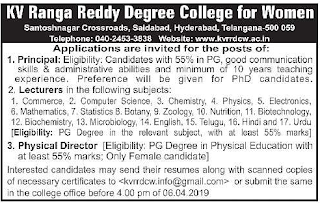 Ending date to apply for KVRDCW Principal/Lecturer Jobs: 06-04-2019. For Principal: candidates with 55% in PG With good communication skills in Englisg Language and 10 years teaching Experience . For Physical Director: PG Degree in physical Education with at least 55% marks only female candidates. Eligible candidates can send their resumes with attach all Educational certificates copies to college email address are given below. Last date to apply is 06-04-2019.